Such Hawks Such Hounds DVD on sale here! As seen at the “Don’t Knock The Rock” Festival – Stoner rock, heavy psych, doom, drone and beyond. 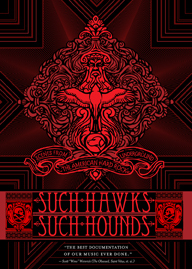 A feature-length documentary, SUCH HAWKS SUCH HOUNDS explores the music and musicians of the American hard rock underground circa 1970-2007, focusing on the psychedelic and ’70s proto-metal-derived styles that have in recent years formed a rich body of unclassifiable sounds. Featured artists include Acid King, Bardo Pond, Brant Bjork, Comets on Fire, Dead Meadow, Earthless, High on Fire, Kyuss, Nebula, The Obsessed,Om, Pentagram, Sleep, sunn O))) and others. (84 mins. Plus Bonus Features / NTSC Region 0). Directed by John Srebalus. Order directly from the DIonysus Records online store. Upcoming live shows and tour dates!